Imagine a flashlight having 350 yards of brilliant white light. We now offer the Outback brand of professional flashlights. Outback’s are strong and durable enough for even law enforcement officers. 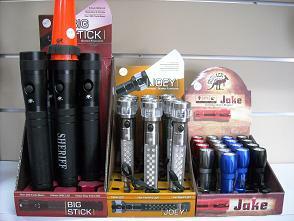 We carry the Outback “Big Stick” Flashlights that are just like the ones the Sheriff’s department carry. They incorporate LED technology which are many times brighter than the standard light bulbs and they won’t break as easily. Even our smaller flashlights are made of the same durable construction and will fit perfectly in your golf cart plus they can survive the vibration of being left in your cart.